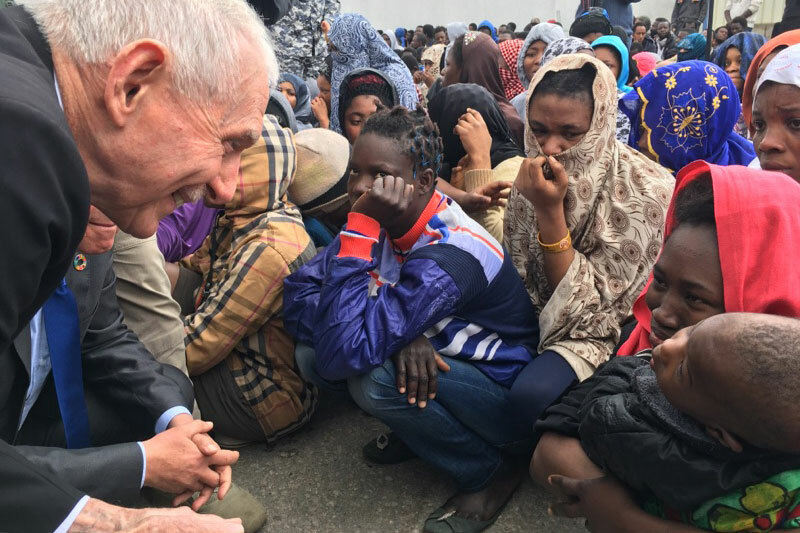 Libya - Today (22/03), IOM Director General William Lacy Swing arrived in Tripoli, Libya, to meet with Libyan authorities regarding the complex migration and displacement situation within the country. “Libya, once a booming economy which many hopeful migrants viewed as a prized destination, is today a country beset by a grave security situation, a collapsing economy and virtually no service provision which is worsening an increasingly complex migration situation,” Ambassador Swing said upon arrival in Tripoli. Through his visit, Ambassador Swing aims to raise the profile of the magnitude of the needs of people in Libya, including migrants and Libyans impacted by the conflict and discuss with the Libyan authorities how IOM can strengthen its technical support to these communities within Libya. Ambassador Swing will meet with the Interior Minister of the Government of National Accord, Alaref Al Khoja and the Chairman of the Presidential Council of the Government of National Accord, Fayes Al Sarraj. There are different migratory flows moving through and towards Libya, driven by underdevelopment, state fragility, marginalization and security threats in West Africa, East Africa and the Middle East. The migration situation is compounded by political insecurity and conflict in Libya, which is further exacerbating existing vulnerabilities of all affected communities in the country, including Libyans themselves. Fostering a stable environment to bring about a much-needed holistic approach to migration governance is now a priority. There are an estimated 303,608 internally displaced persons (IDPs) in Libya, according to IOM’s Displacement Tracking Matrix. A majority have been displaced from areas in the north-east and north-west of the country, particularly in Sirte and some parts of Benghazi. Displaced Libyans are suffering from a lack of access to essential services, including critical medical assistance, and economy opportunities. IOM works with local government and communities to promote stability and development for IDPs, migrants and local host communities in Libya, as well as to help establish a better system of managing the migration situation on the ground. Economic prosperity pre-2011, porous borders, and the complex realities of the political and economic situation in Libya and other regional countries have seen Libya hosting various mixed migration flows, consisting of forced migrants, labour migrants, migrants seeking onwards travel to Europe and migrants who are long term residents of the country. It is estimated that between 700,000 to 1 million migrants have remained in Libya despite the insecurity they face. Ambassador Swing will also meet with migrants at Triq Al Sekka detention centre, where he will speak to Head of the Directorate for Combatting Illegal Migration, Ahmed Issa, about how IOM can continue to support the centre’s migrants through, for example, direct assistance, infrastructure development and voluntary humanitarian return. Due to the situation in the country, many migrants are turning to IOM to help them get home. Yesterday, IOM helped 160 stranded migrants return home to Cote d'Ivoire from Tripoli. IOM has helped 13,691 migrants get home to safety since 2011. Increased support to voluntary humanitarian return is essential to improving migration management, and a long-term commitment to forging links between effective reintegration schemes, stability and local development potential in communities of return is of vital importance. IOM is launching an Action Plan for Libya to work with the Libyan authorities to address the many challenges faced by migrants, IDPs, returnees and the affected Libyan population. The approach is grounded in two key objectives, which are to urgently provide humanitarian assistance and protection to affected populations in Libya and contribute to stability, build capacities and resilience of Libyan authorities, as well as crisis affected populations themselves.